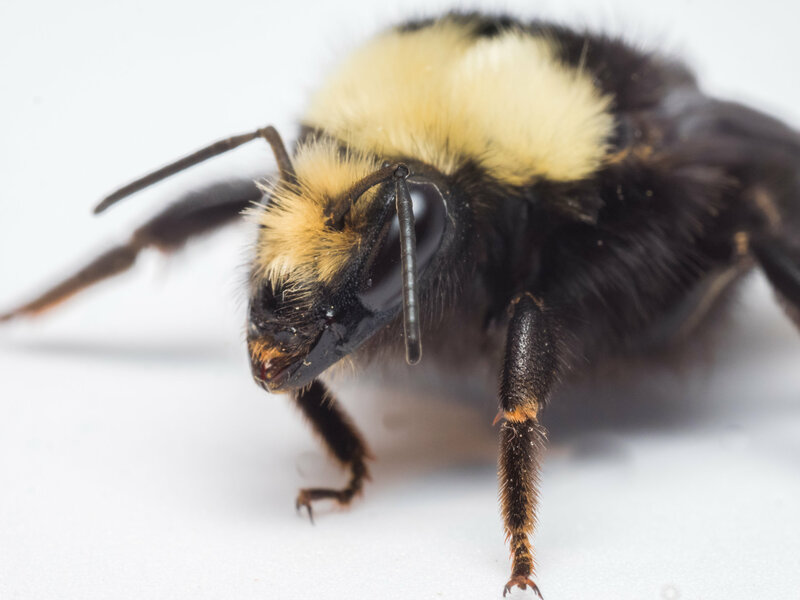 Identification Tips: Bombus vosnesenskii have a bright yellow face, partially yellow thorax and a primarily black body with a yellow segment on their lower abdomen. Males sometimes have slightly more yellow on their abdominal segments. These bumbles have short, even hair that covers their entire bodies and a medium tongue length. Queens are large, approximately 18 to 21 mm long. Worker size varies widely, ranging from 8 to 17 mm long. Drones (i.e. males) are 10 to 15 mm long. Females carry pollen on their back legs with special hairs covering their corbicula (pollen baskets). They will “wet” carry the pollen by mixing it with nectar. Bombus vosnesenskii can be easily confused with B.californicus, B. caliginosus, B. occidentalis and B. vandykei. Nesting Habits: Like honey bees, B. vosnesenskii are eusocial, colony dwelling bees. Mated queens emerge in early Spring to scout suitable nesting sites, often setting up shop in abandoned rodent dens or other dry hollows in the ground. The queen will raise the first generation of workers, taking care of all the foraging, incubating and tending to the young. Once a workforce has matured, the queen’s function becomes solely reproductive. Mature colonies range from 200-300 individuals. Drones are reared in summer to mate with newly emerged queens. At the end of the season, the colony workforce and any remaining drones die out, leaving the newly mated queens as the only members of the colony to overwinter. Preferred Forage: Yellow-faced bumblebees are generalists feeders, preferring to forage from areas rich in flower diversity. They are great for pollination of many agricultural crops, especially tomatoes! They are frequently used in commercial agriculture for greenhouse pollination. Active Season: Queens emerge in early Spring, earlier than most species of bumblebees. Colonies are active late into fall before the first frost. Fun Fact: The yellow-faced bumblebees’ early arrival in Spring and ability to feed on a wide range of flowers makes them particularly suited to city life! They may be outcompeting other species of bumblebees for resources, though, especially in urban environments.